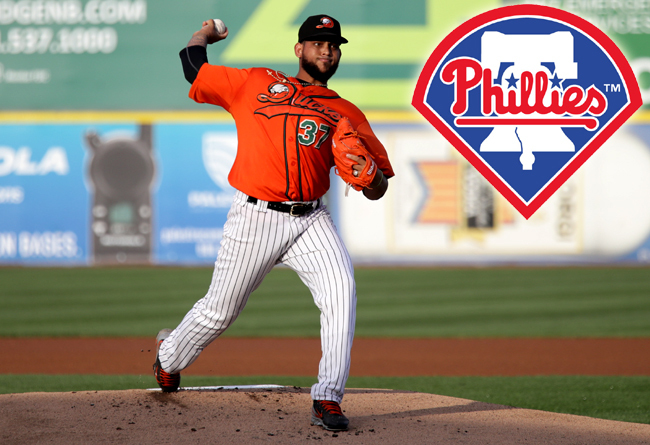 (Central Islip, N.Y., Sept. 13, 2017) – The Philadelphia Phillies today called up former Long Island Ducks pitcher Henderson Alvarez to the Major Leagues. He returns to the game’s highest level for the first time since May of 2015, when he was a member of the Miami Marlins and is the third member of the 2017 Ducks to reach the MLB level after spending time on Long Island this season. Alvarez made seven starts for the Ducks after signing with the team on July 14. The righty totaled a 2-1 record with a 3.09 ERA, yielding just 11 earned runs in 32 innings of work. The Venezuela native pitched a season-high seven innings on August 20 in Long Island’s 6-5 walk-off win over the Lancaster Barnstormers. Prior to that, he had given up just one run over five innings and earned the win in each of his previous two starts. The Phillies purchased Alvarez’s contract on August 26 and assigned him to Triple-A Lehigh Valley in the International League. With the IronPigs, he made three starts and totaled a 2-0 record with a 2.84 ERA and gave up just six earned runs in 19 innings of work. In his final start on September 4 against Scranton/Wilkes-Barre (AAA, Yankees), he twirled seven innings of one-run ball, allowing just five hits and two walks while striking out three. The 27-year-old has spent five seasons in the Major Leagues, including two with the Toronto Blue Jays (2011-12) and three with the Miami Marlins (2013-15). In 92 MLB starts, he has compiled a 27-34 record with a 3.80 ERA, five complete games, five shutouts and 296 strikeouts over 563 innings. The Miami resident was selected to represent the National League at the 2014 MLB All-Star Game in Minneapolis. In addition, he tossed a no-hitter for the Marlins on the final day of the 2013 season in a 1-0 walk-off win over the Detroit Tigers.